As it's wedding season (at least it is for those in the Northern Hemisphere!) I couldn't help but give you another wedding tip. I know last month's tip was also a wedding one and I promise this will be the last one this year! I was at a wedding recently, as a guest not as photographer, and it struck me that as a guest you have opportunities that the professionals often don't get - the more unusual wedding photos. A photo down the line of the group (like the one I took that you can see here). And there will be plenty of other possibilities too! One way to make your photos a bit more classy is to use a shallow depth of field (that's what I did here). This creates a really sharp foreground and a blurry background. Here you can find out more about controlling depth of field. 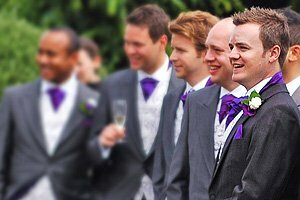 And if you're interested in taking wedding photography a step further there's a complete wedding photographers package that will get you on your way. See you next month, and no more wedding tips - I promise! PS: As you already know my website and all the tips are, and always will be, free. If you find the site useful and would like to say thanks, how about buying me a coffee? $2 for a single espresso - perks me up! $3 buys a double espresso - should keep me writing away for hours!! $5 four shots - That'll keep me writing new content into the small hours!!! You could be donating a steaming hot beverage in just a couple of clicks.